Blue Raider Leadership Summit ..
Higher ed magazine awards Stud.. Internationally recognized flute artist Ai Goldsmith will collaborate with two faculty members in MTSU’s School of Music, flutist Deanna Little and pianist Lillian Pearson, in a free public concert on the MTSU campus Tuesday, Jan. 21. The special performance is set for 6 p.m. Jan. 21 in Hinton Music Hall inside the university’s Wright Music Building. A searchable campus map with parking notes is available at http://tinyurl.com/MTSUParkingMap13-14. The artists will perform works by Eugene Bozza, Philippe Gaubert, Francis Poulenc, Yuko Uebayashi and Ernesto Köhler. 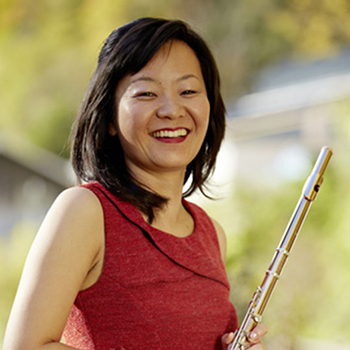 Goldsmith has presented solo recitals and performances on stages across the United States and beyond, including the National Flute Association Convention in Anaheim, Calif., with pianist Miles Graber, the Mid-South Flute Festival and the San Francisco International Flute Festival as well as a recital tour of Tokyo and Saitama, Japan, and an appearance at Italy’s Tuscia Opera Festival. Goldsmith currently provides private flute instruction in Cupertino, Calif.
To discover more MTSU School of Music performances, call 615-898-2493 or visit the “Concert Calendar” page at www.mtsumusic.com.